This small lake near Khabarovsk my family had come just for one night, to swim and to get some fresh air. The lake is situated at the Bolshoi Ussuriiski Island. This 400 sq km fertile island was for long time the matter of a dispute between Russia and China. Several years ago the island was divided between two countries. The area where I was fishing with my friends some years ago now belongs to China, and the eastern part of the island belongs to Russia. In the morning I woke up before the sunrise — in summer, when the water temperature is close to 30 degrees Celsius, the fish is most active very early and also late. I put into the inflatable kayak two rods — 3 weight and 9 weight. The boat is slowly moving across the lake to the lake outlet, a narrow channel connecting it with the Amur River. It is already hot and humid — almost like in Brazil.. the day will be burning. To make the roving less boring I make a cast and start dragging a little skating fly. There were rises of feeding fish on the way, and I had one bite of a small skygazer, long and skinny fish. I am coming to the Amur River. At the mouth of the channel the current is forming a deep hole with a back-current. In this place there are lots of rises of some small fish. The big predators are not visible; what kind of small fish are here? With 3 weight I am starting to catch the sawbellies. This little fish looks like a European bleak but its mouth is much stronger, and there is a string spine in the dorsal fin. Its feeding habits are also different — the sawbelly is often feeding on tiny fish. Sawbellies were biting the tiniest streamers on #12 and 14 hooks and also the skating flies. The sawbellies were also «eating» a small wobbler-fly made for grayling. This last lure I had tied to the tipped to make sure in its rapaciousness. Well, we know on the small ones in this place, and what about the biggies? I change the rod to 9 weight, and drop the anchor upstream of the back-current. My main hope is the skygazer — this predator is often feeding in such deep places, holding below the schools of little fish. The water is murky, so there is no much hope on the streamers. I start to fish with a 7 cm long pearl-and-yellow Belly-Up type wobbler-fly. The Belly-Ups are easy-to-use flies which are catching fish even in complicated situations. The backs of their hooks are weighted with a strip of lead; on the retrieve they move with their blade and hook up. In this place I was not able to get any bites except one: something little and agile had bitten the big fly near the very bank. It was the three-lip; this is an active little predator. Three-lip is a leaper; it can bite the lures of almost any size. It is a pity that this fish does not grow large.. Big mouth allows the three-lip biting big size lures and flies It is becoming hot — time to go to the camp. On the way I am planning to fish the banks of the lake, so I change the fly for a red Centipede. 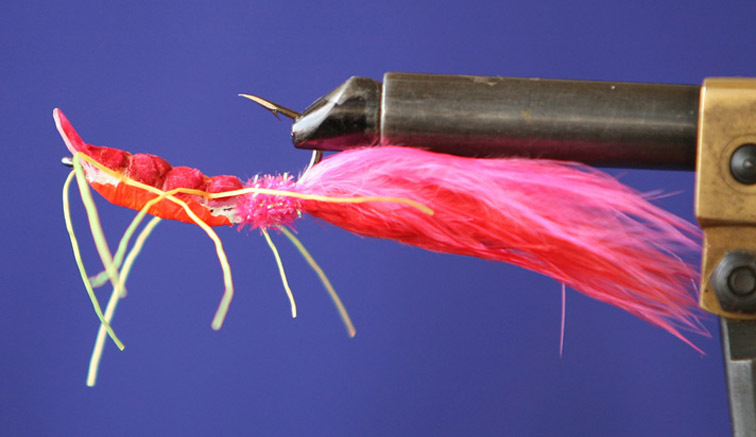 This is another Belly-Up wobbler-fly with marabou tail and rubber legs. The Centipede is one of the best pike flies, nd it is also catching different other predators — from taimen to catfish.